Small enough to fit on any tabletop or floor play area, the CPS Mini Rollercoaster is a great tool to increase your child's intelligence and creativity. 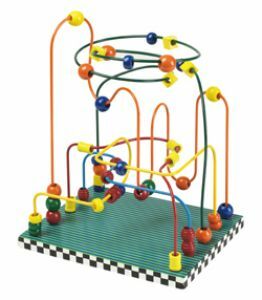 Not only will they stimulate basic learning skills such as visual tracking, eye-hand coordination, and shape and color recognitions while they play with it, they'll also have fun! Part of the Colors, Patterns, Smiles Line, it's fun AND educational! Size: 8" by 10" by 12"